Polymers and copolymers of, and surgical devices made from lactide and/or glycolide and/or related compounds are well-know. See, e.g., U.S. Patent Nos. 2,668,162, 2,683,136, 2,703,316, 2,758,987, 3,225,766, 3,268,486, 3,268,487, 3,297,033, 3,422,181, 3,442,871, 3,463,158, 3,468,853, 3,531,561, 3,565,869, 3,597,449, 3,620,218, 3,626,948, 3,636,956, 3,736,646, 3,739,773, 3,772,420, 3,733,919, 3,781,349, 3,784,585, 3,792,010, 3,797,499, 3,839,297, 3,846,382, 3,867,190, 3,987,937, 3,878,284, 3,896,802, 3,902,497, 3,937,223, 3,982,543, 4,033,938, 4,045,418, 4,057,537, 4,060,089, 4,137,921, 4,157,437, 4,243,775, 4,246,904, 4,273,920, 4,275,813, 4,279,249, 4,300,565, and 4,744,365, U.K. Pat. or Appln. Nos. 779,291, 1,332,505, 1,414,600 and 2,102,827, D.K. Gilding et al., "Biodegradable polymers for use in surgery-polyglycolic/poly (lactic acid) homo-and copolymers: 1, "Polymer, Volume 20, pages 1459-1464 (1979), and D. F. Williams (ed.) Biocompatibility Of Clinical Implant Materials, Volume II, chapter 9: "Biodegradable Polymers" (1981). Absorbable multifilament sutures such as Dexon, Vicryl, and Polysorb commercially available from Davis & Geck (Danbury, Connecticut), Ethicon, Inc. (Sommerville, New Jersey), and United States Surgical Corporation (Norwalk, Connecticut), respectively, are known in the industry as short term absorbable sutures. The classification short term absorbable sutures generally refers to surgical sutures which retain about 20 percent of their original strength at three weeks after implantation, with the suture mass being essentially absorbed in the body within about 60 to 90 days post implantation. Long term absorbable sutures are generally known to be sutures which retain about 20 percent of their original strength at six or more weeks after implantation, with the suture mass being essentially absorbed in the body within about 180 days post implantation. For example, PDS II, a synthetic absorbable monofilament suture, commercially available from Ethicon, Inc. (Sommerville, New Jersey), retains about 20 to about 30 percent of its original strength at six weeks after implantation. However, PDS II exhibits minimal mass loss until 90 days after implantation with the suture mass being essentially absorbed in the body about 180 days after implantation. Maxon, commercially available from Davis & Geck (Danbury, Connecticut) is another absorbable synthetic monofilament generally fitting this absorption profile. U.S. Patent No. 4,444,927 describes a process for fabricating dioxanone articles by heating a mixture of polydioxanone and finely divided sucrose or lactose nucleating agent. The '927 patent teaches that as a result of the presence of nucleating agents, the cycling time of injection molding of the polymers can be significantly reduced in many cases. However, the '937 patent does not disclose or suggest that such blends would reduce the mass loss absorption time, let alone disclose blending fine particles of fast absorbing polymers with longer term absorbable polymers to reduce the mass loss time of the longer term absorbable polymers. It has been found that five bioabsorbable particles such as fine particles of polyglycolide and/or copolymers of glycolide and lactide advantageously be blended with other bioabsorbable polymers, such as polydioxanone, polylactide, polycaprolactone, polytrimethylene carbonate, etc. to form a bioabsorbable polymeric blend useful in forming surgical articles, such as surgical sutures, which exhibit an increase mass loss profile as discussed hereinabove. Multifilament sutures of the present invention may be made by methods known in the art. Braid constructions such as those disclosed and claimed in U.S. Patent No. 's 5,059,213 and 5,019,093 are suitable for multifilament sutures herein. A suitable process for the manufacture of monofilament sutures comprises the operations of melt extruding the resin at an extrusion temperature of from about 90°C to about 200°C to provide a monofilament, stretching the solidified monofilament at a temperature of from about 30°C to about 60°C in water (or other suitable liquid medium) or at from about 25°C to about 95°C in air (or other suitable gaseous medium) at a stretch ratio of from about 3:1 to about 10:1 to provide a stretched monofilament. Optionally, the stretched monofilament may be stretched again in air or other suitable gaseous medium preferably at 1.05:1 to about 1.40:1. The suture may then be annealed at a temperature of from about 40°C to about 100°C to provide the finished suture. Fig. 1A schematically illustrates a monofilament suture manufacturing operation which is especially suitable for producing larger size sutures, e.g., those of sizes 2/0 and larger. Extruder unit 10 is of a known or conventional type and is equipped with controls for regulating the temperature of barrel 11 in various zones thereof, e.g., progressively higher temperatures in three consecutive zones A, B and C along the length of the barrel. Pellets or powder of the bioabsorbable polymer and fine bioabsorbable polymer particles can be introduced to the extruder through hopper 12. Optionally the five bioabsorbable polymer particles can be blended with the bioabsorbable polymer prior to placement in the hopper. Motor-driven metering pump 13 delivers melt extruded resin at a constant rate to spin pack 14 and thereafter through spinneret 15 possessing one or more orifices of desired diameter to provide a molten monofilament 16 which then enters quench bath 17, e.g., containing water, where the monofilament solidifies. The distance monofilament 16 travels after emerging from spinneret 15 to the point where it enters quench bath 17, i.e., the air gap, can vary and can advantageously be from about 0.5 to about 100 cm and preferably from about 1 to about 10 cm. If desired, a chimney (not shown), or shield, can be provided to isolate monofilament 16 from contact with air currents which might otherwise affect the cooling of the monofilament in an unpredictable manner. In general, barrel zone A of the extruder can be maintained at a temperature of from about 80°C to 110°C, zone B at from about 100°C to 190°C and zone C at from about 120°C to about 200°C. Additional temperature parameters include: metering pump block 13 at from about 120°C to about 180°C, spin pack 14 at from about 120°C to about 180°C, spinneret 15 at from about 120°C to about 180°C and quench bath at from about 15°C to about 60°C. In the stretching operation shown in Fig. 1A, generally suitable for larger size sutures, e.g., sizes 2 to 2/0, monofilament 16 is drawn through hot water (or other suitable liquid medium) draw bath 30 by means of godets 104, 105, 106, 107 and 108 or any other suitable arrangement of godets which rotate at a higher speed than godet station 21 to provide the desired stretch ratio. The temperature of hot water draw bath 30 is advantageously from about 30°C to about 65°C and preferably is from about 40°C to about 55°C. In an alternative stretching operation shown in Fig. 1B, generally preferred for smaller sutures sizes, e.g., sizes 3/0 to 8/0, monofilament 16 is drawn by godets 104, 105, 106, 107, and 108 or any other suitable godet arrangement through hot air convection oven chamber 30' at a temperature of from about 25°C to about 95°C and preferably from about 40°C to about 75°C to provide the desired amount of stretch. Following the stretching operation shown in Fig. 1A or 1B, monofilament 16 optionally may be subjected to an on-line annealing and/or additional stretching without shrinkage or relaxation with shrinkage operation as a result of which the monofilament shrinks. In the processes of Figs. 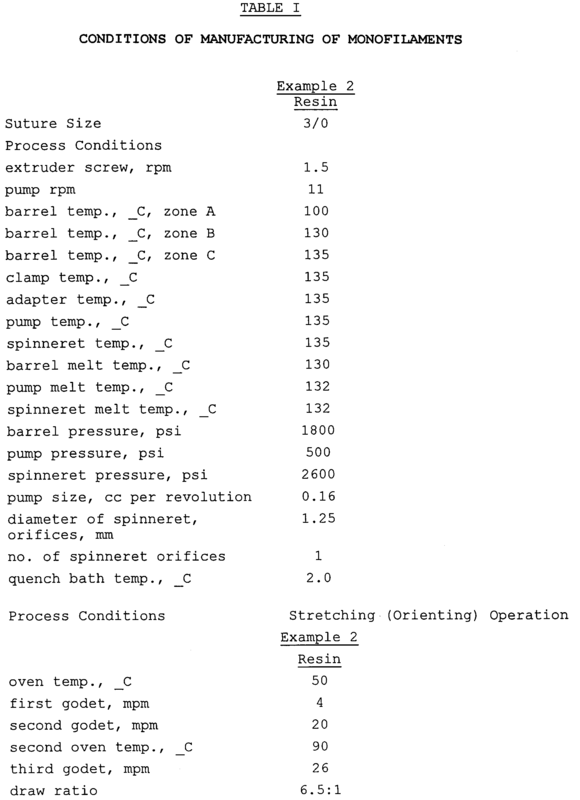 1A and 1B, on line annealing with or without relaxation when desired is accomplished by driving monofilament 16 by godets 36, 109, 110, 111, and 112 or any other suitable godet arrangement through second hot air oven chamber 35 at a temperature of from about 40°C to about 95°C and preferably from about 50°C to about 85°C. During the relaxation process, at these temperatures, monofilament 16 will generally recover to within about 80 to about 98 percent, and preferably to within about 90 percent, of its pre-annealed length to provide the finished suture. For relaxation, the third godet station rotates at a slower speed than the second godet station, thus relieving tension on the filament. Annealing of the suture also may be accomplished without shrinkage of the suture. In carrying out the annealing operation, the desired length of suture may be wound around a creel and the creel placed in a heating cabinet maintained at the desired temperature, e.g. about 40°C to about 95°C, as described in U.S. Patent No. 3,630,205. After a suitable period of residency in the heating cabinet, e.g., about 18 hours or so, the suture will have undergone essentially no shrinkage. As shown in U.S. Patent No. 3,630,205, the creel may be rotated within the heating cabinet in order to insure uniform heating of the monofilament or the cabinet may be of the circulating hot air type in which case uniform heating of the monofilament will be achieved without the need to rotate the creel. Thereafter, the creel with its annealed suture is removed from the heating cabinet and when returned to room temperature, the suture is removed from the creel, conveniently by cutting the wound monofilament at opposite ends of the creel. The annealed sutures, optionally attached to surgical needles, are then ready to be packaged and sterilized. The fine particles of polyglycolide of Example 1 (5 grams) and 1,4 dioxane-2-one (5000 grams) are added to a reactor. The mixture is blended at 100_C, with stirring under a nitrogen atmosphere for 24 hours. The polyglycolide/poly 1,4 dioxane-2-one blend was then sampled. The fine particles of polyglycolide of Example 1 (5 grams) and 1,4 dioxane-2-one (5000 grams) are added directly to the hopper of a monofilament extruder (commercially available from J.J. Jenkins, Inc.). The polyglycolide particles and 1,4 dioxane-2-one are extruded, stretched and annealed under conditions set forth in Table II below to form a suture. A composition as in claim 1 wherein the first bioabsorbable polymer has a melting point higher than the melting point of the second bioabsorbable polymer. A composition as in claim 1 wherein the first bioabsorbable polymer is selected from the group consisting of polylactide, polyglycolide and polylactide-co-glycolide. A composition as in claim 1 wherein the second bioabsorbable polymer is selected from the group consisting of polymers of lactide, caprolactone, dioxanone and trimethylene carbonate. A composition as in claim 1 wherein the first bioabsorbable polymer has a particle size in the range of about 0.1 to about 1 micron. A composition as in claim 1 wherein the first bioabsorbable polymer comprises about 0.01 to about 1 percent by weight of the composition. A composition as in claim 1 wherein the first bioabsorbable polymer comprises about 0.05 to about 0.5 percent by weight of the composition. A suture fabricated from the composition of claim 1. A surgical device as in claim 9 wherein the first bioabsorbable polymer has a melting point higher than the melting point of the second bioabsorbable polymer. A surgical device as in claim 9 wherein the first bioabsorbable polymer is selected from the group consisting of polylactide, polyglycolide and polylactide-co-glycolide. A surgical device as in claim 9 wherein the first bioabsorbable polymer polymer is selected from the group consisting of polymers of lactide, caprolactone, dioxanone and trimethylene carbonate. A surgical device as in claim 9 wherein the first bioabsorbable polymer has a particle size in the range of about 0.1 to about 1 micron. A surgical device as in claim 9 wherein the first bioabsorbable polymer comprises about 0.01 to about 1 percent by weight of the composition. A surgical device as in claim 9 wherein the first bioabsorbable polymer comprises about 0.05 to about 0.5 percent by weight of the composition. A method as in claim 16 wherein the shaping step comprises extruding the composition to form a filament. A method as in claim 16 wherein the step of preparing a composition comprises mixing a first bioabsorbable polymer having a particle size in the range of about 0.1 to about 1 micron with pellets of a second bioabsorbable polymer. A method as in claim 16 wherein the step of preparing a composition comprises adding the first absorbable polymer to the second bioabsorbable polymer to produce a mixture containing about 0.01 to about 1 percent by weight of the first bioabsorbable polymer. A method as in claim 16 wherein the first bioabsorbable polymer is selected from the group consisting of polylactide, polyglycolide and polylactide-co-glycolide and the second bioabsorbable polymer is selected from the group consisting of homo-and copolymers of lactide, caprolactone, dioxanone, and trimethylene carbonate. A suture prepared in accordance with the method of claim 16. ES2040719T3 (en) * 1986-09-23 1993-11-01 American Cyanamid Company bioabsorbable coating for a surgical article. "Application contains still more references"